Camondo stairs are stylish steps in Istanbul, near the Galata Tower in Beyoglu district. The stairs were built by a Jewish banker and philanthropist Abraham Salomon Camondo (1781-1873). Abraham wanted his children to have a shorter way from home to their school, so started to build the stairs in about 1870-1880 in what then was Constantinople. The staircase provided a shortcut not only to school of the famous banker's children but also to the family-owned bank on what is now called Bankalar Caddesi (Banks Avenue). Today the stairs serve as a fashionable walk up to the Galata Tower in Istanbul and city's attraction. Location: Banks street (Bankalar Caddesi), Karakoy, Istanbul. The stairs are between the "Tunel" metro stop and the Galata Tower. Camondo family starts its history in Spain. In 1492 Jews were forced to flee Spain due to a decree which required all residents to convert to Catholicism. The Camondos ran to settle in Venice. When the city became in the middle of Austro-Prussian war the family moved to Istanbul. In 19th century Galata area of Istanbul had mainly Jewish population. The Camondos was a famous successful family who established their own banking system Camondo and Cie in 1802. Abraham Salomon Camondo was the main banker in the Ottoman Empire. The Empire’s first bank was established only in 1863. Abraham Camondo also served as a financial advisor to governments of Italy and Austria. Members of Camondo family were mostly bankers. There were art collectors and pilots among them. Today Camondo generation is only a history. Some of the family was killed in World War I, some in Auschwitz concentration camp. As prominent financiers The Camondos took an active part in Istanbul’s social life. Abraham Salomon established Jewish consistory, an institution governing Jewish community’s social and political life in Istanbul. He also made valuable input to the Turkish-Jewish heritage in Istanbul. Abraham Salomon Camondo sponsored repair of synagogues, built a primary school, theater, two apartment buildings and trendy stairs, known as the Camondo stairs (or spelled as Kamondo stairs). Rue Camondo was the name of the street where the stairs led to. Now the street is called Bankalar Caddesi (Banks Avenue). The stairs were built in the architectural style of 19th century. A mix of two French styles was used - Art Nouveau (the “new style”) and the Baroque Revival style (also known as Neo-baroque). Istanbul is a city of hills. The stairs turned out somewhat steep. To prevent anybody from falling all the way down to the bottom of the steps special design was exercised. Note the hexagonal shape. It allows the catch if anyone slips and falls. In April 2005, the stairs were restored in the framework of "Remembering the Camondos" initiative. The staircase was decorated with flowers. 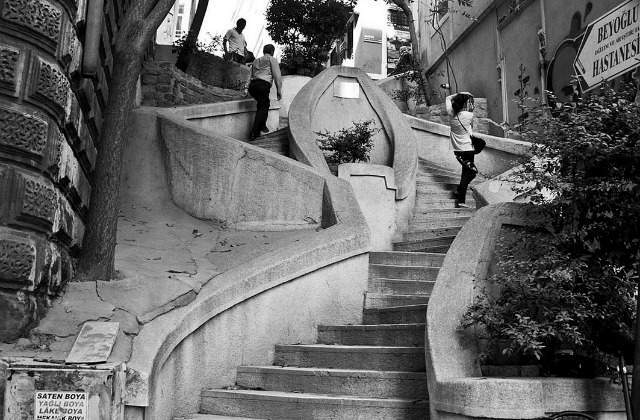 In 1964 famous French photographer Henri Cartier-Bresson took Camondo stairs images as part of his trip to Istanbul. Moroccan writer Pierre Assouline wrote a book "The Last Of The Camondos" (“Le dernier des Camondo”). He described life of Moise Camondo and life of Jews in Catholic France.